We are conducting, and have completed, several trials in order to demonstrate the value of neo-adjuvant studies as a platform to qualify new drugs and drug combinations, and improve drug development. We have also designed several clinical trials to optimise the use of molecularly targeted therapies. We have worked on improving delivery of radiotherapy for better loco-regional control with less toxicity. Results of trials led from Cambridge have already facilitated changes of UK practice in breast radiotherapy, for instance titanium clip placement to allow accurate tumour bed localisation and the extension of the use of Intensity Modulated Radiation Treatment. Cambridge has established a ‘one-stop’ clinic, the Cambridge Breast Unit, for rapid diagnosis of breast cancer. The diagnostic accuracy of the triple assessment (clinical examination, imaging and biopsy) is 99.6%. 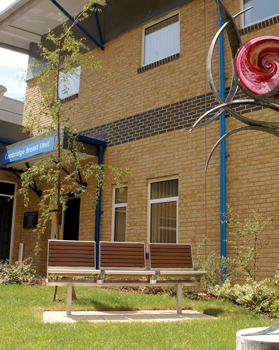 Nine-year survival rates of breast cancer patients treated at Addenbrookes Hospital is 84%, compared with a regional average of 78%. Around half of patients diagnosed with breast cancer at the clinic enter a clinical trial run by the Cambridge Breast Cancer Research Unit. The Cambridge Breast Cancer Research Unit has collected over 20,000 tumour samples from breast cancer patients. This large diverse collection of tissue samples will be essential in the development and testing of new ways to diagnose the different types of breast cancer. A major collaborative research project analysing the genetic barcodes of 2,000 breast cancer samples, with 5–15 years follow-up, has identified 10 different types of breast cancer. Each has distinct molecular characteristics and different survival rates, which will now inform different treatment options. The results of this research are being used to develop new tests to diagnose different breast cancer types, which will then enable each patient to be given the most effective course of treatment. Cambridge is also helping to unravel the full genetic sequence for breast cancer, as part of an international initiative to identify the genetic blueprint of 50 cancers. One of the significant successes of the Cambridge Cancer Centre has been to establish the BOADICEA web-based BRCA1 and BRCA2 carrier probability prediction model as a clinical tool for familial cancer clinical worldwide. In the next few years we expect to have identified multiple loci that modify the breast and ovarian cancer risks in BRAC1 and BRCA2 deleterious mutation carriers. These variants will be incorporated into the model. Ultimately one of the questions we want to answer is what are the characteristics, in terms of penetrance and population frequencies, of confirmed cancer susceptibility alleles. PREDICT is a breast cancer prognosis and treatment web-based tool. It has been developed on the basis of clinical research data collected in the UK to aid multi-disciplinary teams in the management of women with early stage breast cancer, in particular whether a patient would benefit from adjuvant chemotherapy. PREDICT is now the prognostic/predictive tool of choice for the Cambridge Breast Unit and is widely used throughout the NHS and beyond to assess the ideal course of treatment post-surgery. This is a breast radiotherapy trial which has resulted in Intensity Modulated and Image Guided radiotherapy being introduced into more UK centres as a standard of care. We have identified how the oestrogen receptor-cistrome in primary tumours modulates response to hormone therapy. We demonstrated differential oestrogen receptor (ER) binding events in primary breast cancer (a first ever) and revealed a role for the pioneer factor FoxA1 as a crucial ER regulatory protein in drug resistant contexts, providing the impetus to develop therapeutic FoxA1 inhibitors. Repeat biopsies to study genomic evolution as a result of therapy are difficult, invasive and may be confounded by intra-tumour heterogeneity. We have demonstrated the clear advantages of using circulating tumour DNA over other tests as a biomarker for monitoring treatment response and disease progression in patients with metastatic disease. Specifically, we have developed a new approach, sequencing of cancer exomes in plasma, to study a series of patients who have developed resistance to chemotherapy, hormone therapy and Trastuzumab, with the aim of identifying potential causing mutations.